1. What is the intended end use of the part? - Does the part need to be rigid or flexible? - Does the part need to withstand pressure or weight? - Will the parts need to withstand certain temperature variations? - Will the parts be exposed to other elements or chemicals? 2. Are there special appearance considerations? - Is a particular finish required? - Does a color need to be matched? - Is embossing a consideration? 3. What, if any, regulatory requirements apply? - Will the product be exported and need to meet REACH standards? - Does the part need to be food safe? - Will children use the product? Plastics fall into two basic categories, thermoset plastics, and thermoplastics. To help you remember the difference, think of thermosets just as the term implies, they are “set” during processing. When these plastics are heated, it creates a chemical reaction that “sets” the part into a permanent form. The chemical reaction is not reversible, so parts made with thermosets can’t be re-melted or reshaped. These materials can be a recycling challenge unless a bio-based polymer is used. Thermoplastics are heated then cooled in a mold to form a part. Once the parts are cooled, they revert to their original state and can be re-melted and cooled again. For this reason, thermoplastics are easier to reuse and recycle. They comprise the majority of the manufactured polymer resins on the market today and are used in the injection molding process. 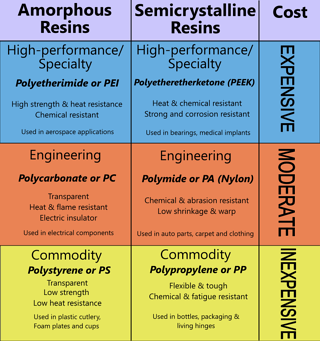 Thermoplastics are categorized by family and type. They fall into three broad categories or families; commodity resins, engineering resins, and specialty or high-performance resins. The high-performance resins also come with a higher cost. That is why commodity resins are often used for many everyday applications. Commodity resins are easy to process and are inexpensive. They are often found in typical mass produced items like packaging. Engineering resins are more expensive but offer better strength and resistance to chemicals and environmental exposure. Within each of these families, some resins have different morphology. Morphology describes the arrangement of molecules in a resin and fall into two categories, amorphous and semi-crystalline. Amorphous resins have the following characteristics: they shrink less when cooled, offer better transparency, work well for tight-tolerance applications, tend to be brittle and lack chemical resistance. Semi-crystalline resins have the following characteristics: tend to be opaque, offer excellent abrasion and chemical resistance, are less brittle and have higher shrinkage rates. 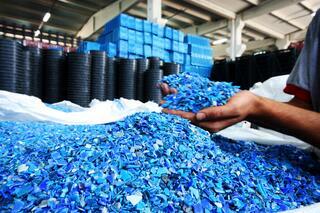 used resins and can be found in plastic cutlery, foam cups, and plates. Higher up on the amorphous scale are the engineering resins such as polycarbonate or PC. It is temperature and flame resistant and has electrical insulating properties, so it is often used in electronic components. An example of a specialty or high-performance amorphous resin is polyetherimide or (PEI). Like most amorphous resins, it offers strength and heat resistance. However, unlike most other amorphous materials it is also chemically resistant, thus often found in the aerospace industry. An inexpensive semi-crystalline commodity resin is polypropylene or PP. As with most semi-crystalline polymers, it is flexible and chemically resistant. The low cost makes this resin the choice for many applications such as bottles, packaging, and pipes. A popular engineering, semi-crystalline resin is polyamide (PA or Nylon). PA offers chemical and abrasion resistance as well as low shrinkage and warp. There are bio-based versions available making this material an earth-friendly alternative. The toughness of the material makes it a light-weight alternative to metal in automotive applications. PEEK or polyetheretherketone is one of the most widely used semi-crystalline high-performance resins. This resin offers strength as well as heat and chemical resistance and is often used in demanding environments including bearings, pumps, and medical implants. When selecting a plastic resin, you should begin by choosing the family of material that will give you most of the properties you want. Once determined, you can select the appropriate grade of material. Several online databases can assist with providing a benchmark from which to work. UL Prospector (formerly IDES) is probably one of the most well-known databases for material selection. MAT Web also has an extensive database, and The British Plastics Federation provides high-level data and descriptions. Various resins have distinct properties for which they are known. As we have seen, resin families (commodity, engineering, and high-performance/specialty) contain both amorphous and semi-crystalline alternatives. However, the higher the performance, the higher the cost. To help keep costs low, many manufacturers use additives or fillers to obtain the qualities they need at a lower cost. These additives can be used to improve performance or convey other characteristics to the final product. Antimicrobial – Additives used in food-related applications or high-contact consumer products. Antistatics – Additives used to decrease the static electricity conduction and are often used in sensitive electronics. Plasticizers and fibers – Plasticizers make a resin more pliable, whereas fibers add strength and stiffness. Flame retardants – Additives used to make products resistant to combustion. Colorants - Additives that add color or special effects such as fluorescence or pearlescence. Choosing the right material for a project is one of the most important factors in creating perfect plastic parts. The advances in polymer science have contributed to the development of a large selection of resins from which to choose. It is important to work with an injection molder that has experience with a variety of resins and applications including resins that are compliant with FDA, RoHS, REACH and NSF. Over the years, The Rodon Group has developed strategic relationships with the best resin suppliers in the country. We have over 50 years of experience using certified commodity and engineering resins that adhere to our stringent manufacturing standards. Unless you are well-versed in resin selection, you should always consult with your injection molder to determine the best material for a particular project. Sources: American Chemistry Council; Georgia Institute of Technology, Atlanta, GA; RTP Engineering Plastics; Blackwell Plastics; British Plastics Federation; Hardie Polymers; Wikipedia.